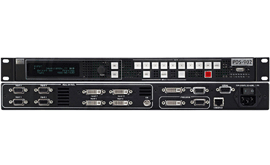 The Barco PDS 902 3G is designed to meet today’s requirements for a high-quality, easy-to-use and fast seamless switcher with more digital inputs at an affordable price. Thanks to its straightforward setup and operation the PDS is a perfect fit for live events, boardrooms, hotel ballrooms, houses of worship, education and training facilities and fixed installations. The Barco PDS-902 3G models feature four DVI-I inputs with full HDCP 1.0 support. All models include one 3G/HD/SD SDI and four universal analog inputs. All analog and DVI inputs support the EDID 1.3 specification. Users can capture and store up to three images that can be used as a LOGO source during the presentation. Built-in test patterns are also provided.